During June 2004 Dyfed Archaeological Trust excavated a timber trackway at Llancynfelyn near Talybont in northern Ceredigion. The trackway was first examined in March 2004 when radiocarbon dates were obtained from two wood samples. These dates indicated that the trackway was built some time between AD 900 and AD 1020. The trackway is on edge of Cors Fochno (Borth Bog). This is an area of wetland containing both tidal and freshwater marshes and it is a site of great ecological importance. For many years the edges of the marshland have been reclaimed for farming. This process is still continuing and has led to the recent discovery of previously unknown archaeological sites. The waterlogged conditions have allowed the survival of materials, such as wood, that would normally decay over time. One such site is the wooden trackway. The trackway is visible on the surface as a low bank running across a pasture field. A single trench was excavated across the bank in March of this year. 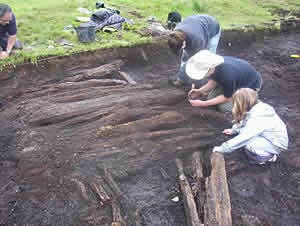 The bank was found to cover a series of timbers forming a walkway about 1.5m wide. The timbers had been laid across two wooden ‘rails’ and the whole structure was supported by a series of wooden pegs or stakes hammered into the peat. Timber trackways of the kind identified at Llancynfelyn have been recorded and excavated in many areas of Britain and Ireland and have a wide date range from the early Neolithic (over 5000 years ago) through to the Medieval period. The pre-Norman conquest dates for the timber trackway at Llancynfelyn were a considerable surprise and adds to the unusual nature of the discovery. It is possible that the trackway provides a routeway across the marsh toward the church and settlement at Llancynfelyn. The excavation of the trackway will help us to understand woodworking techniques and the way that local woodland was managed for timber during the early medieval period. The excavation will also tell us about the nature of the environment 1000 years ago in this area of Ceredigion. We would like to thank the farmer, Mr Dilwyn Jenkins, for allowing us to excavate in his field, to Cadw for providing financial support and to the students and staff of the University of Birmingham who are helping with the dig. The salvage recording of a timber box-structure was undertaken in September 2002, at Llangynfelyn, near Talybont (NGR SN64929064). The structure had been reported by a local farmer during land improvements on the southern edge of Cors Fochno (Borth Bog). Two Bronze Age radiocarbon dates were obtained for samples from the oak timbers and evidence of an associated burnt mound was identified when the field was subsequently ploughed. This salvage work was followed in March 2004 by the small-scale evaluation of a linear feature located in an adjacent field with support from the Cadw contingency fund. The linear feature proved to be the remains of a timber trackway that had subsequently been sealed by layers of gravel. Two of the timbers provided 10th-11th century AD calibrated radiocarbon dates. During June the Trust undertook the partial excavation of the timber trackway. The work involved students from the Institute of Archaeology and Antiquity at the University of Birmingham. Two areas of the trackway were examined accompanied by an extensive programme of palaeo-environmental sampling. Dendrochonological dates suggest that three of the timbers are from trees that were felled between AD1080 and AD1120. One of the trenches was located at the southern end of the visible causeway where the trackway was found to overlie an extensive area of burning and industrial debris. Samples from this waste will hopefully give an indication of the nature and date of the industrial processes that were taking place in this area. It seems possible that the trackway linked this area of industrial activity with the ‘island’ of Llangynfelyn to the north. The excavation attracted extensive local interest with visits from all the local schools and a very successful open day. The work also received lots of coverage from the local media and TV news. The Trust ran a ‘dig diary’ to coincide with the excavation in 2004 and this can still be viewed here. 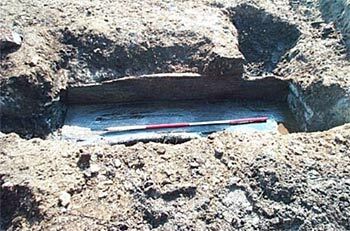 Wood identification from the 2004 excavation demonstrates the use of oak and alder in the trackway, which reflects the resources on and close to the bog edge. Initial assessment of pollen from below the trackway has also identified that ash, birch and hazel were growing in the area prior to the track being constructed. Charcoal recovered from the industrial deposits were submitted for radiocarbon dating and dates of 60BC – 90AD and 20AD – 220AD were obtained, which suggest late Iron Age – Roman activity. The Llangynfelyn - Talybont area has a long and well-documented history of lead and copper working, with several mines of varying dates, including possible Roman workings. The nature of this activity is at present uncertain. However, some form of processing associated with lead smelting seems the most likely. 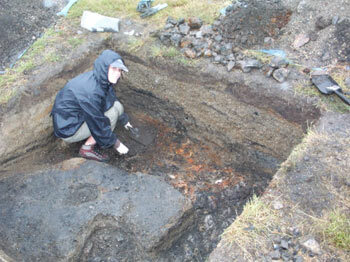 It may be that smelting was in fact taking place to the south or east, on the dry ground on the southern bog margin. The Roman fort at Erglodd, c.500m to the southeast of the site, may also be relevant, suggesting a Roman military presence in the area possibly to secure local metal resources. This represents the second season of excavation on the Borth Bog trackway site and it again involved students from the University of Birmingham. · determine the relationship, if any, between the industrial deposits and the trackway. · assess the extent, character, date and significance of the industrial deposits and any associated processing complex. · retrieve more dating evidence for the trackway and industrial material. · undertake a systematic programme of palaeoenvironmental sampling to investigate the pre-industrial landscape and to assess the impact of the industrial activity on that landscape. Location plan showing excavation area. The remains of the smelting hearth were uncovered in T21. To achieve those aims it was decided to implement a strategy of open area excavation and test-pitting. 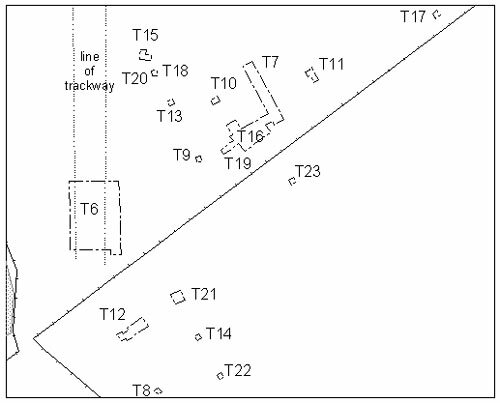 Two open area excavations were opened; at the southern end of the trackway (T6 – this re-opened part of T4 from 2004) and across a prominent earthwork (T7), which was thought a promising furnace location. The test-pits, which initially measured 1m x 1m, were excavated across a wide area. Some test pits were expanded to further investigate revealed features and deposits. It is clear that the trackway is later than and, therefore, not directly associated with the industrial activity. A smelting hearth was located. Galena and waste residues found in association with it indicate that lead smelting was taking place on the site. Extensive deposits of processing debris and waste material were recorded over a wide area and it appears that the industrial activity extends for some distance east – west along the bog edge. Sampling was undertaken to provide material for palaeoenvironmental analysis, dendrochronology, radiocarbon dating and industrial analysis to aid the understanding of the site and its place in the landscape. An interim report on the excavation has been completed and submitted to Cadw. Assessment and initial analysis of wood timbers for identification and dendrochronology – Nigel Nayling.